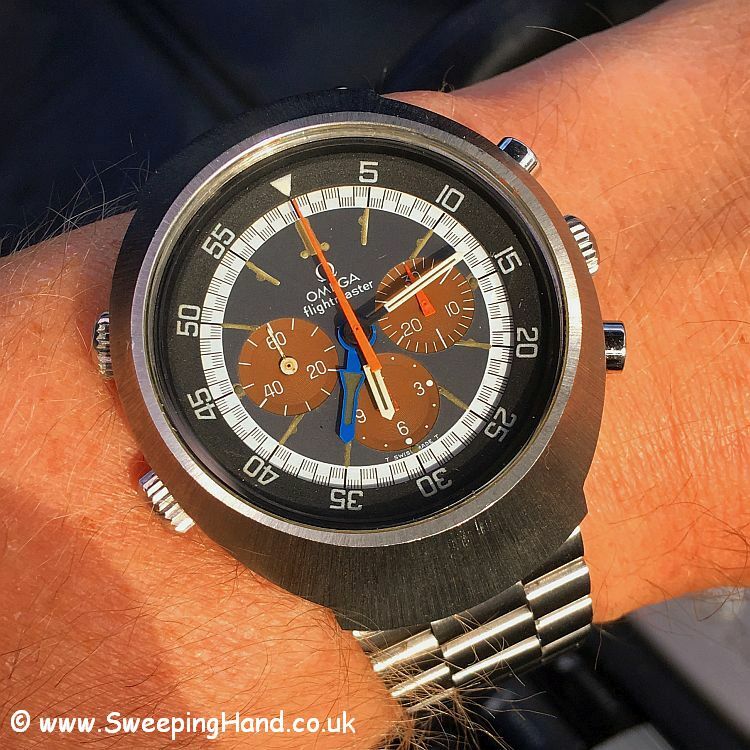 Here we have a stunning and rare Mk2 Omega Flightmaster 145.026 with a killer tropical brown dial from the early 1970’s. The Omega Flightmaster was designed in 1969 specifically for pilots to be able to tell the time in different time zones by utilising a separate blue hour hand and a calibre 911 movement giving full chronograph features. Omega cases of the late 60’s and 70’s were certainly ground breaking in their designs and the Flightmaster is no different. 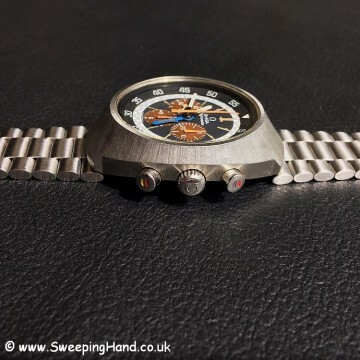 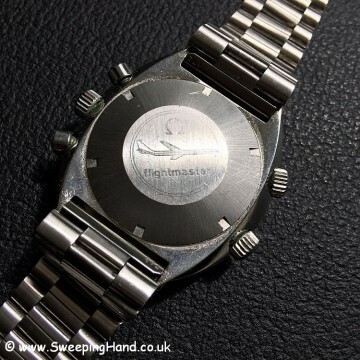 The stainless steel case was pressed and tempered 16 times before it takes the unique elliptical shape designed perfectly to fit the contours of the wrist. 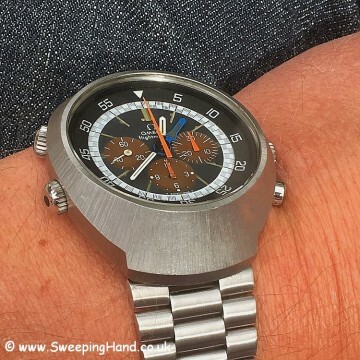 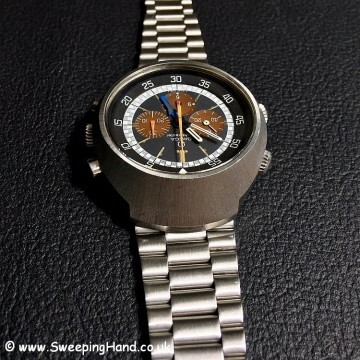 Like it’s Speedmaster brother the Flightmaster was also used in space. 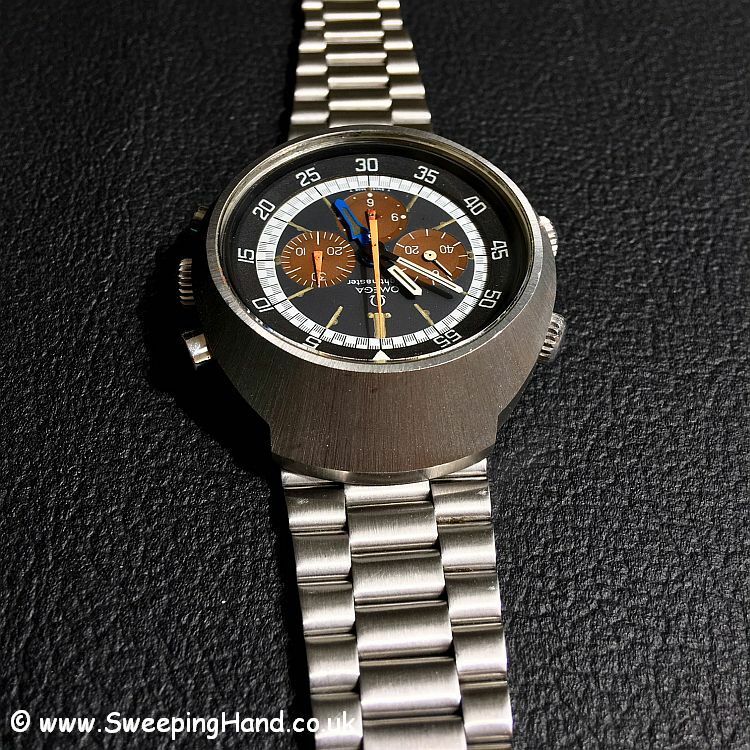 This time in 1975 when cosmonaut Alexei Leonov wore a caliber 911 Flightmaster during the joint American-Soviet Apollo-Soyuz mission. 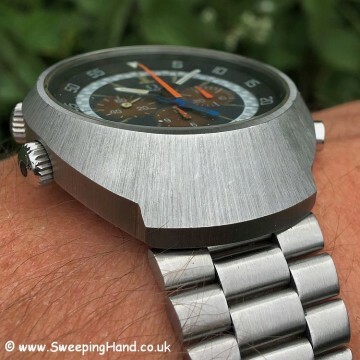 Excellent examples of the Flightmaster are becoming harder and harder to find with many having degraded dials and badly damaged and scuffed cases. 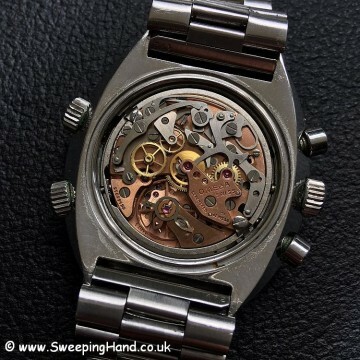 This watch however is an absolute stunner! It has a beautiful tropical brown dial. The three sub dials on the watch, that were originally black, have turned a lovely deep chocolate brown with the main dial having a lovely matching aged patina still with all of it’s original lume. 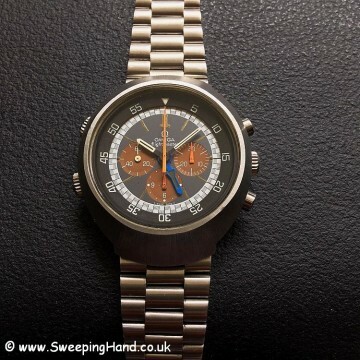 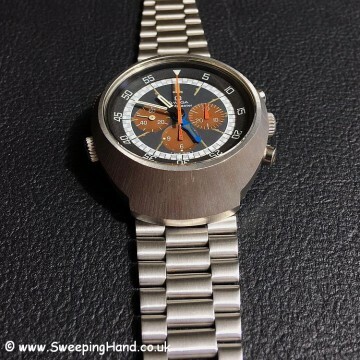 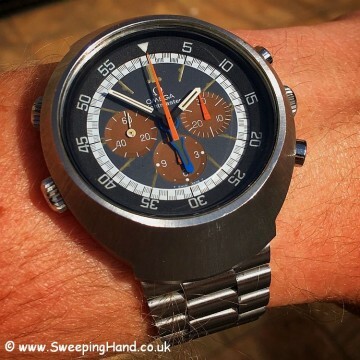 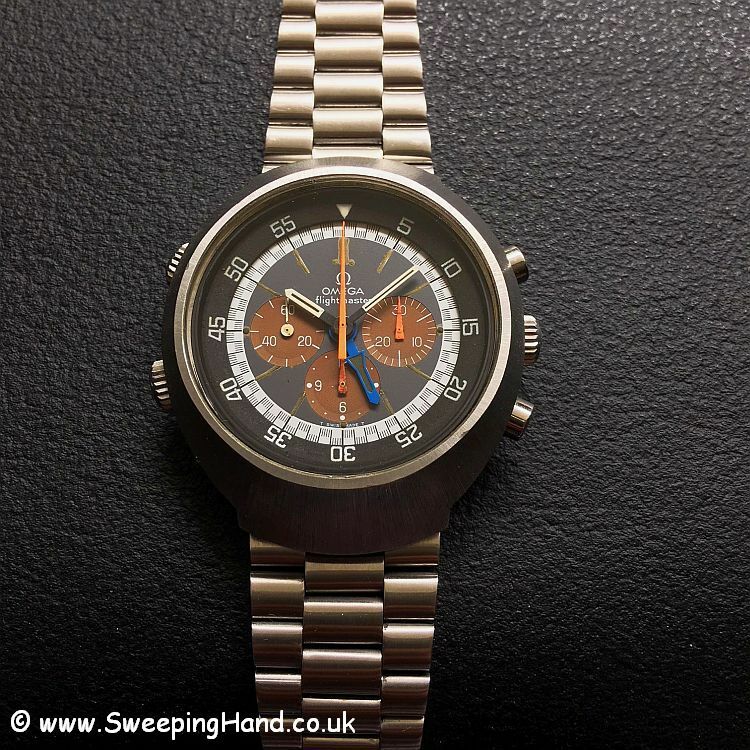 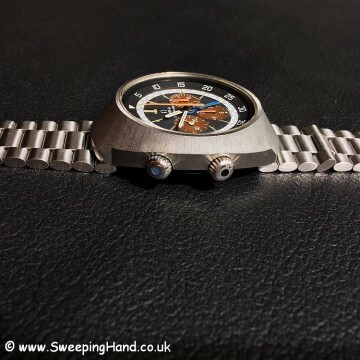 The case on this watch, with the famed early ‘starburst’ finish, is in superb condition as can be seen in the pictures and with a mint crystal is keeping very good time and all chronograph settings are working as they should. 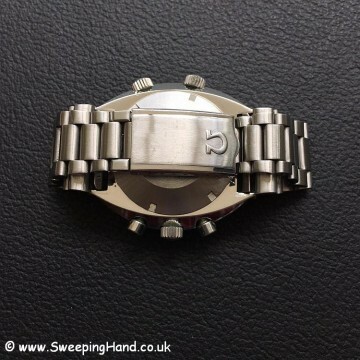 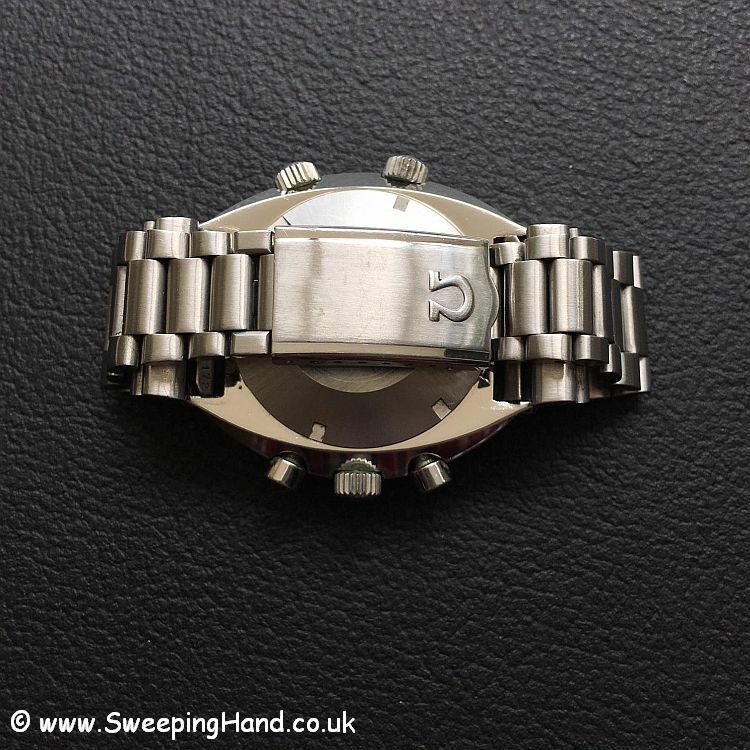 The watch comes on its original Omega logo bracelet and although no original box or papers are with it after nearly 50 years, it will come delivered in an original Omega zipped carry pouch and with our usual SweepingHand Authenticity Guarantee.